After exploring batik on my own and studying it at school, the process of applying wax as a resist has been ingrained to the point that I do the same to my paintings. Especially with this piece, “tree”, as it’s being called for now, I used the wax as something I could remove later and have the color underneath show through. I’ll scrape off the wax in areas that I want to lighten up. With this painting, I’m trying to flood the space with the limited light of sundown. Being a warm glow, angled so that a gold ray shines through the trees, it presents a theme of past, a story told when the day is done. 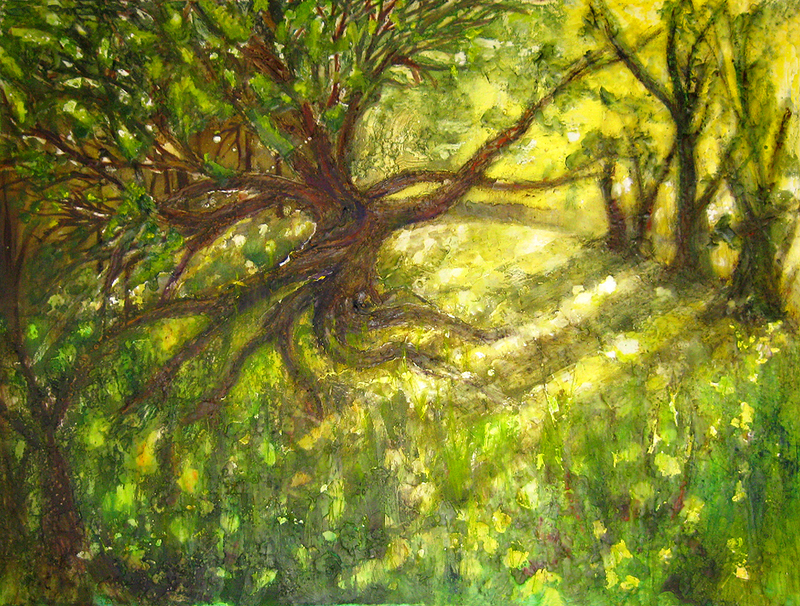 “Tree”, with its gnarly branches and exposed roots, has treasures of experience. After a century of life, soaking up its surroundings, all with light and shadows, creatures going about their day and elemental sky over head, it has tales to tell. I really love trees, and your paintings were no exception. I really like the swirling quality of the branches, but especially the roots. You thought they were somewhat sad? They seemed quite hopeful to me, actually. Thanks for liking my blog, btw.